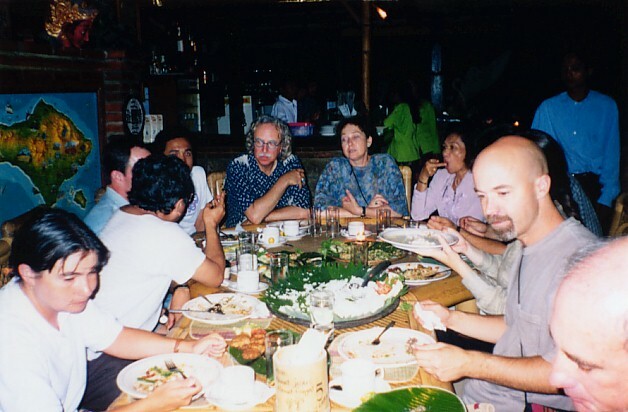 That evening we'd arranged for Sumandhi and his family to come to Ubud for a big dinner out at Nomad's - the restaurant owned by Linda's landlord. It was a fabulous feast, and great to hang out with Sumandhi and his wife and son. 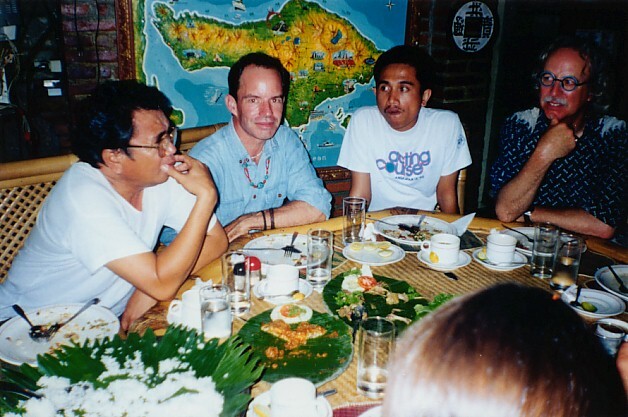 This photo shows (left to right) Sumandhi, Eli's friend Tony, Sumandhi's son Komang, and Eli Hollander - professor of film and video at UCSC, who had just arrived in Bali to work with Linda on a set of documentary films on Balinese life rituals. As you can see it was quite a spread of delicious Balinese food. 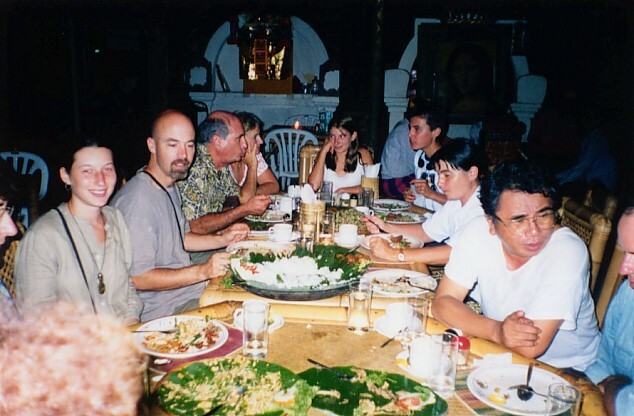 Here, left to right, is my wife Astrid, Sumandi (with his back turned), Tony, Komang, Eli, Linda, Sumandhi's wife, Justine (obscured), Steve, and Dan Phillips. 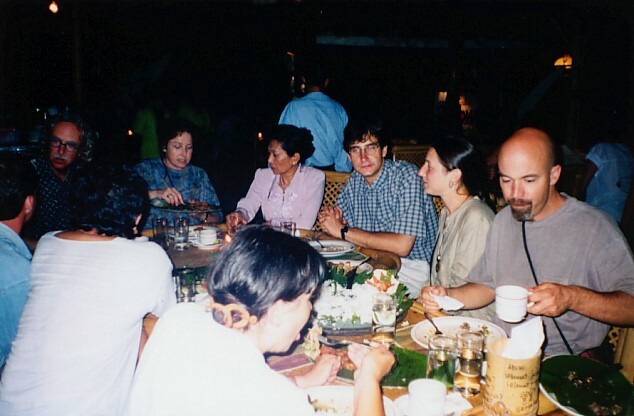 From the other end of the table, left to right: Justine, Steve, Dan Phillips, his wife Judy, our kids Julia and Dan (with ubiquitous Walkman), Astrid, Sumandhi. Clockwise around the table: Astrid, Sumandhi, Tony, Eli, Linda, Sumandhi's wife Putu Sutiati, our French-Canadian jegog-playing friend Pierre-Olivier (who we picked up in Singapadu), Justine and Steve. It was a great evening, with great company and great food, and we ate and talked late into the night.